Just wanted to thank Sheldon, Sean and Sean for a great snorkelling experience. We came off a cruise ship on march 13/14 and the whole experience from pick up to drop off was smooth and stress free. Wouldn't hesitate to use this crew and company again. The sea turtles were great fun and the shipwrecks made great snorkeling. Throughout Randall was a fantastic host telling us about the history of the island and what we were seeing as we sailed the west coast in great conditions (he also made a great bar man). Would thoroughly recommend using them. Randall was even kind enough to drop us off on the beach of our hotel....much to the envy of other guests. Great time and good value. We had a fantastic time on Super Cats on 28 Feb 2014. Swimming with the sea turtles and fish was an awesome experience. The crew, Randel and Preacher, were fantastic and the small sail boat provided a private feel on our cruise. We will definitely go again on our next trip to Barbados! Thank you for another wonderful day, this is our fourth year and as usual it was wonderful, preacher and Randal were the perfect hosts. Robert, Michelle and the girls. 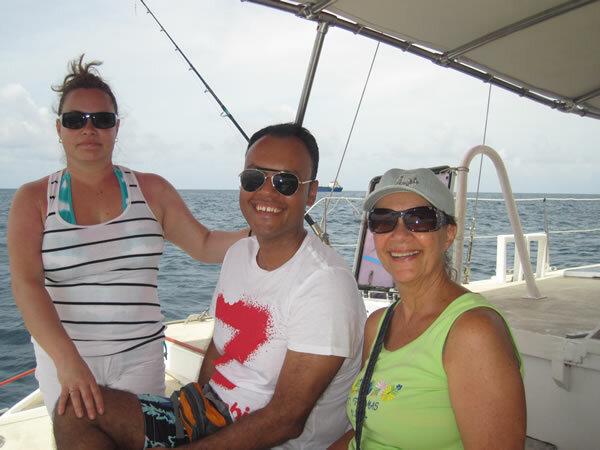 We boarded your smaller catamaran on Thursday, January 30. It was a nice, intimate group of 6. We'd like to thank Super Cats and the marvelous crew, Randel and Preacher, for the wonderful snorkel adventure with the sea turtles and at the shipwrecks. The sail up the beach was beautiful and relaxing. You took great care of us and helped make our day in Barbados memorable. I would like to thank the crew of Stiletto and especially the captain for making my friends birthday last Friday so enjoyable. He encouraged her into the water as she had mobility problems and then helped her to snorkel for the first time. He had patience and took her out to the wrecks too using a float. I had a great time too. We just got back from our trip with Randall and Preacher. I cannot imagine a better time. Everything went smoothly and the food was delicious. Preacher and Randall seemed like the were part of our group. Amazing trip. Just got back from southern caribbean cruise. Wanted to thank you for a great experience. We were on the monday jan 13 out of Barbados. Will recommend to friends,family and co workers. Hello, I just wanted to pass onto you that we thoroughly enjoyed our charter on 1-14-14. Our crew members were Randal and Preacher. They were the best! Entertaining, knowledgeable and fun to be with. That's your crew. The food they served was delicious. The drinks Preacher made were excellent! Both crew members added to the adventure by sharing their knowledge of the area and "gossip" (which famous people recently stayed at the high end resorts) adding to the fun of the charter. Please pass onto them our "Thanks for the great memories"! We won't hesitate to recommend your company, even if they have to use the mother ship, instead of our intimate smaller version boat. It was a fun time and Randal and Preacher made us feel like family. I just want to let you know how much fun we had on our outing. Sheldon and his crew were fantastic. Definitely the highlight of our vacation. In particular, I have a significant health problem, and despite my challenges, Sheldon was there to assist me the entire way. Helping me in and out of the water, etc. He made a huge difference in my experience. Please give him my thanks. He will probably remember me - my name is Bob, and he had to basically carry me back into the boat. I will post a note on trip advisor. Had a fab time on Boxing Day with Sheldon, Sean 1 and Sean 2!! Second time we have been on the boat and loved it every time! Sheldon and his crew ensured everyone was having a good time wether you were jumping in with the turtles on staying on the boat to tan :) Our whole group loved the good and all agree is the best food by far :) hoping to come back again soon as rainy England is no fun! Thank-you for another lovely trip!! Hi Sheldon and crew, thank you all very much for a great, great time. Thank you Graham, Sean and Eric for a spectacular day on the water....even though it rained! We had a blast! We sailed with you on June 9, 2013. It was our first day on the island and your tour gave us a lot of great information about Barbados. After our week long stay, we have determined the best food on Barbados was served on your boat! Yum! Yum! Also, Zach wants to spend next summer working on your boat. He loved it THAT much!!!!! You guys are awesome! We will sail with you again! Thanks so much for the wonderful 5 h excursion today! The whole crew were wonderful (including safety, lunch, drinks etc.) and we had a great tine with the sea-turtles and fish! The friendly atmosphere made everybody in great spirits! Just a quick email to say what a great time we all had on Stiletto on Tues 19th for Yvonne`s 40yr trip.Yvonne really enjoyed it and thank you so much for organising the cake.Would you please pass on our thanks to the crew Eric & can`t remember the Capt`s name for a great time.The whole trip was a great success & throughly enjoyed by her crew. I did not feel like sharing a huge Cat with a bunch of people. Even though Graham offers bigger cats I actually choose the smaller 30ft Stilleto since we were only 4 passengers. Great sailing and "closeness" to the water. They took us snorkling around both turtles and wrecks and served up one of the best Bajan lunches I had during our 10 day stay. Great choice of beverages throughout the day. Both Graham and his deck-hand were very professional and offered a very personal experience. I have bee on many chartered boats and this one is really in the top. The best tour of our Caribbean vacation! We took along our 13 month old baby and had a blast. We wanted to also thank you for sending us our disposable underwater camera that we left by accident. It arrived last week and the photos we got were beautiful =). Thank you Graham and crew for making this trip as memorable and wonderful as it was. Five stars! Hi Graham, Just a quick email to say a big thank you for taking us out on Stiletto last week, we had a great time and will never forget your generosity and island hospitality. Please give our regards to Eric, you both worked so hard to ensure all aboard had a great day, it was a real pleasure to be with you. We're back in the UK now and the weather is terrible here, missing Barbados a lot, hope to return soon and use your excellent sailing services again. Graham - Thank you for taking me and my friends out last Thursday. I think it was the highlight of our friend's trip. We've cruised on a couple of other boats and some of our American friends have too, but yours is the best. I just put up a review on trip advisor to say thanks for a great time. We really enjoyed ourselves.